Papayas are packed with nutrients and antioxidants that are beneficial for your skin, hair, and overall health. Being rich in alpha hydroxy acids, it has anti-aging properties. Moreover, it helps improve the skin’s tone and texture. The fruit contains vitamin A, vitamin C, vitamin E, magnesium, potassium, and so on. To derive its various beauty benefits, you can eat papaya and also apply it on your skin. Besides, you can even use its peels. Simply rubbing the inside of a fresh papaya peel on your skin in circular motion for 20-30 seconds and then washing it off with lukewarm water is also useful as it exfoliates your skin and removes dead skin cells. Plus, it helps make your skin soft and smooth. • Prepare a homemade face mask by mixing one teaspoon of organic honey and a beaten egg white in half a cup of papaya pulp. You may also add a tablespoon of plain yogurt in case you have sensitive skin. Leave this mask on your skin for five minutes and then wash it off with warm water, followed by a cold water rinse. • Applying a combination of papaya pulp and organic honey makes your skin smooth. It is particularly good for dry, mature skin. To prepare this recipe, blend half a cup of papaya and three tablespoons of honey. Leave it on your face and neck for about 15 minutes and rinse it off with warm water. Follow up with a moisturizing cream. • Another similar mask can be prepared by blending half a cup of papaya, a tablespoon of yogurt, whisked egg white, and one teaspoon each of lemon juice and honey. Applying this recipe on a regular basis helps remove blemishes and assists in skin whitening. • When dealing with blemishes and dark spots, apply a piece of papaya mashed along with one tablespoon of honey and two tablespoons of milk. Leave this mask on your skin for 15-20 minutes and then rinse it off. This papaya remedy helps reduce wrinkles, too. Follow this beauty treatment once or twice a week. Here’s a video showing how to make a papaya and honey skin-care mask. • You can also make a body scrub by combining papaya with olive oil, honey, and sea salt. • Puree one cup each of pineapple and papaya. Add a tablespoon of honey in it and apply the mixture on your face. Rinse it off after 15 minutes to get glowing skin. • Take half a cup of papaya, mash it, add four teaspoons of white clay (use green clay if you have oily skin), and a teaspoon of aloe vera gel in it. Smear this refreshing and exfoliating facial mask on your face and rinse it off after 15 minutes. 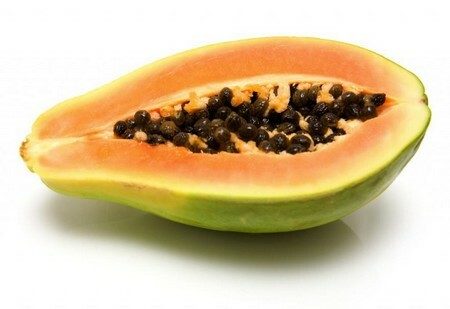 • Blend a cup of unripe papaya in a blender together with one teaspoon each of plain yogurt, honey, and vitamin E oil. Leave this skin lightening mask on your skin for 15-20 minutes before washing with cold water. • You can make a papaya and oatmeal facial scrub at home mashing two slices of ripe papaya and mixing two egg whites, five tablespoons of oatmeal, and a teaspoon of lime juice in it. • Rubbing mashed papaya pulp on sore and cracked heels helps heal them naturally. • Prepare a papaya deep conditioner for hair by blending a cup of ripe papaya, a cup of ripe banana, a cup of plain yogurt, and one tablespoon each of organic coconut oil and molasses. Apply this mixture on damp hair for about an hour and then wash it off. • You can prepare another easy hair mask by blending diced papaya along with a cup of yogurt. You may also add milk and honey in this recipe. Besides, you can eat papaya to enhance your beauty and improve your health as it aids in digestion, boosts immunity, relieves nausea, reduces high blood pressure, protects against heart disease, and lowers the risk of age related macular degeneration.